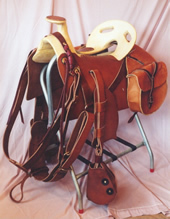 A skeleton-rigged south west Texas (Santa Fe)/Mexican influenced saddle. Very much like the simpler saddle ridden by men hired to hunt for construction camps, mining camps, wagon trains, etc. Men who needed and wanted a fully functional rig, yet very horse and rider friendly. Dates from 1840s. Ft. Laramie. 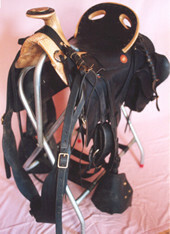 Black saddle built on new wide tree with leather grith and coat straps or strings - $925.00. Saddlebags and Breast Collar are extra. Ft. Laramie. Saddle Tan saddle built on new wide tree with leather girth and coat straps or strings - $875.00.